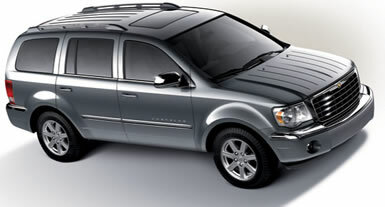 San Francisco: Chrysler has felt left out of the full-size and large SUV market. Despite fielding the Dodge Durango, there was no luxurious large SUV in the fold. Now there is. Taking the Durango’s form but giving it a Chrysler style, the Aspen is designed to take the feeling of the wildly successful 300 sedans and pump it up to SUV status. One could argue that in times of rising gas prices and melting icebergs, maybe it’s time to back away from large SUVs, but at this point, they are selling more than 2 million full-size SUVs a year in America, and that’s enough to give Chrysler the urge to field its own entry. The Aspen follows today’s trend of a big, chrome-laden grille, and it does it with the signature Chrysler face of today, including the corporate chrome wings and gold seal. The overall design of the car itself is clean and attractive, if not especially distinctive. Inside, the instrument panel features an elegant gauge cluster, with black letters on silver and chrome rings. Silvery accents decorate the steering wheel and run up the bold center console and along the doors. Attractive burl-style woodgrain (not from real trees) creates the effect of luxury. An analog clock sits at the top of the center console. Especially noteworthy is the bright cabin illumination when you open the door. It emits an unusual cool, fluorescent-like glow. The Aspen wears a scored hood, with lines echoing its small sibling, the Crossover, as well as the brand new Sebring. It’s a bona fide Chrysler design cue now. Under this hood lies one of two V8 engines - no V6s, thank you. The standard engine is the 4.7-liter Magnum V8, which puts out a reasonable 235 horsepower and 300 lb.-ft. of torque. The optional powerplant is the famous 5.7-liter Hemi, which uses its extra liter of displacement to push horsepower up an even hundred to 335, and torque up to 370. Both engines deliver power through a five-speed automatic transmission. To offset some of the thirstiness of the big bruiser, the Hemi engine employs Chrysler’s Multi-Displacement System (MDS), which switches off half of the cylinders when they’re not needed, such as on smooth, level highways. This saves fuel, and is pretty much undetectable to the driver. My Light Khaki Metallic test unit had the smaller engine, but I didn’t feel that the car was underpowered. With EPA ratings of 14 City, 18 Highway, I averaged 13.5 mpg. At least it uses regular gas. The EPA Green Vehicle Guide gives the Aspen, with four-wheel drive and the smaller V8, an Air Pollution score of 7, which is pretty good. The Greenhouse Gas score, however, is a 1. Chrysler has borrowed the Aspen name from the 1970’s, when the company attached it to a midsize sedan that is mainly remembered today for its poor quality. That’s too bad, because the quality of this Aspen seems quite high. Built in Newark, Delaware, this all-American rig claims to be competing with luxury SUV entries such as the Cadillac Escalade and Lincoln Navigator, but it undercuts them in price. You have to give up a few things to achieve this, however. The Aspen doesn’t have automatic climate control or heated seats. The CD player is a single slot unit. The optional Sirius satellite radio display shows only the station number and name - no artist or song information. The payoff, though, is at the bottom line of the sticker. My Limited four-wheel-drive model base priced at $33,520, and with a few options, including leather seats, a trailering package, and an upgraded audio system, hit $36,545. Lincoln Navigators start at $46,575, and Cadillac Escalades at $55,400. Perhaps comparing the Aspen to a Chevrolet Tahoe, at $34,755, would be more appropriate. The Limited is the only model Aspen available now. You can order four-wheel drive or two. With the 4.7-liter V8, the difference is $2,775. Of course, there are copious options that you can use to drive the price up while customizing your Aspen to suit you.